The leading online recruitment company Jobstreet.com recently released the 2013 ANNUAL SALARY REPORT which contains The Top 10 highest paying Jobs in the Country according to position levels such as Fresh Graduate Salaries, Junior Executive Salaries, Supervisor Salaries, Manager Salaries and Senior Manager Salary in different fields of discipline. Jobstreet.com generated the summary of jobs with the best salaries based on salaries posted by employers on JobStreet.com in the first quarter of 2013. To view the complete list check it here. Ace that competitive Job on July 13, 2013 during Jobstreet.com Career Fair in Cebu at SM City Cebu. POEA-licensed agencies and top companies like Coca Cola, Sun Cellular, Lexmark, Sykes and Convergys are expected to draw more than 3,000 Cebuano job seekers. Avoid long lines and become one of the first to meet top companies, Be prioritized by Pre–registering now for your FREE Fast Lane Access. Your Fast Lane Access will be emailed to you 2 – 3 days after registration. 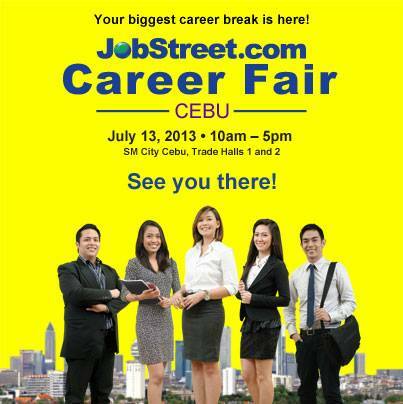 To Pre-Register for the Jobstreet.com Career Fair in Cebu, click this link. 0 comments: on "Over 90 Companies to Join Jobstreet.com Career Fair in SM City Cebu"